112CarlotaGalgos: At the very heart of 112Carlota Galgos are Galgos and children... En el corazon de 112 carlota Galgos son galgos y niños. This web page is dedicated to every Spanish Galgo who is being tortured as you read this, and awaiting the kind hand of courage to come in and rescue them. Every letter I have written, had published, and every person I have spoken to about the galgos, it is in dedication to them. To the associations who work tirelessly to save, mend and further protect Galgos from the cruel hands of the hunter. PLEASE HELP..DIRECT HELP FROM THE COMPANY TO THE DOGS MOUTH.. HELP COMES IN MANY WAYS, BUT FOOD IS A GREAT WAY AND BY THE EASE OF THIS COMPANY WE CAN FEED OUR GALGOS AND PODENCOS IN OUR CARE WITH THE BEST DIET AND ATTENTION. CLICK THE LINK AND FOLLOW THE GUIDE.. OR CONTACT THE COMPANY DIRECTLY. DELIVERY WILL COME STRAIGHT TO THE ASOCIATION AND TO OUR DOGS BOWLS!!! MMMMmm MANY THANKS, FROM US ALL. At the very heart of 112Carlota Galgos are Galgos and children... En el corazon de 112 carlota Galgos son galgos y niños. A galgo in the making..
Attent activities, and galgos leaving a mark in the heart of the young..
At the very heart of 112 Carlota Galgos are of course "galgos" coupled with "children" they make way for new beginnings. 112 Carlota galgos takes very seriously the potential which a child offers the future. In every aspect of life, the young child is a sponge which absorbs what is around him/her. The very environment in which they grow up in, play in, live in, is what they will replicate as reality and normality. It's here where change can take place. If we make normality in a childs life, care and welfare of an animal it will become their reality. Many a child still hasnt been awakened to what a "galgo" is. From the classes and talks we have been to its interesting to see their approach, their reasoning and their ideas. The very way they embrace Charlie the fluffy galgo, hold him, caress him, cuddle him to feel the warmth he offers them, to the porcelain galgo who has been injured and needs very careful attention. All taken very seriously in the participation of the children in the class. Aside having a giggle, at making galgos and activities which are fun, I have been spotted locally on the road by one of the children saying to his father excitedly "thats the Señora of the galgos".. galgos not forgotten! The children of today make way for tomorrow, they bring with them the blessings which we teach them, the joys in which we show them they can gain from certain things. They can live a life blinded from animals and the love they give. But to talk with them, let them see what is real for a galgo as a hunting dog, and what can be real as a loved dog impacts them deeply and will help them make choices later on in life, which is really not so much "later on!" This is where the heart of the asociation lies, in the hope and prayer that these children make future police, mayors, presidents, and they could even be hunters!! Yep, they could even be. BUT if they have had grounding, and understand the pain and disruption of negligence it offers possible change. If they understand the warmth and love a galgo can give, it makes way for a best friend to entre into their lives, to share all their secrets, be there on sad days, cold nights and playful garden days chasing balls or just running round the park. This is my dream, the 112 carlota galgo dream, that the children become the future with change for the Spanish Galgo, for someone has to make change, and it could well be, one of these children where a galgo has touched their hearts as a youngster and made way for progress for what is an endangered breed of dog, in that it spends its life known as the silent sufferer, the tortured breed, the runner, .. its here I hope that if not now, but as these children grow up, that they will "raise the galgo back up in society as the household pet, it so deserves to be!" Kids, you are brilliant. I thoroughly enjoyed my time with you all, all the classes Ive been into, will go into, if we have helped leave a spark of love from a galgo in your hearts, then its something special that wont be forgotten. Ever! En el corazón de 112 galgos Carlotason por supuesto "Galgos", junto con los "niños" que abren el camino para un nuevo comienzo. 112 galgos Carlota toma muy en serio el potencial que un niño ofrece al futuro. En todos los aspectos de la vida, el niño es una esponja que absorbe lo que está alrededor de él / ella. El entorno mismo en el que crecen , donde juegan, viven, es lo que van a replicar como la realidad y la normalidad. Es aquí donde el cambio puede tener lugar. Si hacemos la normalidad en la vida del niño, el cuidado y el bienestar de un animal este se convertirá en su realidad. 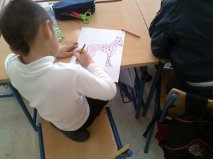 Muchos niños aún no se han dado cuenta de lo que es un "galgo" . De las clases y charlas que hemos estado a sido interesante ver su enfoque, su razonamiento y sus ideas hacia ellos. La manera que reciben a Charlie el galgo suave y esponjoso, cogiendolo, acariciandolo, abrazandolo para sentir el calor que les ofrece, y este es un galgo de porcelana que se ha lesionado y necesita una atención muy cuidadosa. 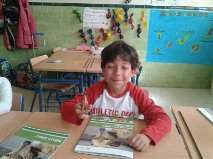 Todos toman muy en serio la participación de los niños en la clase. Además teniendo una risita, en la fabricación de galgos y actividades que son divertidas, que se han detectado a nivel local en la carretera por uno de los niños diciendo a su padre con entusiasmo ", esa es la Señora de los galgos" .. y la palabra galgo no se les olvida! Los niños de hoy dan pasos para el mañana, traen con ellos las bendiciones que les enseñan, las alegrías en la que Les enseñamos que pueden obtener de ciertas cosas. Ellos pueden vivir una vida cegada hacia los animales y el amor que dan. Pero para hablar con ellos, hacerles ver lo que es real para un galgo como un perro de caza, y lo que puede ser real como un perro amado a les impacta profundamente y les ayudará a tomar decisiones más adelante en la vida, que en realidad no es tanto "más tarde! " Aquí es donde el corazón de la Asociación se encuentra, en la esperanza y oración que estos niños que los futuros policías, alcaldes, presidentes, y que incluso podrían ser los cazadores! Sí, incluso podría ser. PERO si se han tenido una base, y comprender el dolor y los trastornos de la negligencia que ofrece el cambio es posible. Si ellos entienden la calidez y el amor que puede dar un galgo, este deja paso a un mejor amigo a que entre en sus vidas, a compartir todos sus secretos, estar allí en los días tristes, noches frías y días alegres en el jardín persiguiendo pelotas o simplemente corriendo alrededor de la parque. Este es mi sueño, el sueño de 112 carlota galgo, que los niños se conviertan en el futuro con el cambio para los Galgos españoles, para que alguien tenga que hacer el cambio, y bien podría ser, uno de estos niños que un galgo ha tocado sus corazones como un joven y dio paso a los avances de lo que es una raza de perro en peligro , en el que pasa su vida conocido como el que sufre en silencio, la raza torturada, el corredor, .. aquí espero que si no ahora, pero a medida que estos niños crezcan, que van a "elevar el galgo en la sociedad como la mascota del hogar, por lo que merece ser!" MY thanks to Galgo News for adding a letter of mine! Running Scared... Another Galgo. Corriendo con miedo, otro galgo! GALGO HUNG IN MADRID FOR CHRISTMAS! GALGO AHORCADO EN MADRID PARA NAVIDAD! La galga de Illescas sigue siendo dificil en acoger! PORFAVOR ..AYUDAR LOS GALGOS EN SEVILLA.. Help needed for galgos in Sevilla.. PLEASE! MY FAVOURITE STATEMENT: "The world is a dangerous place, not because of those who do evil, but because of those who look on and do nothing!" Albert Einstein. "El Mundo es un sitio peligroso, no porque algunos personas son malvados, pero porque hay gente quien se quedan mirando y no hace nada!" ALBERT EINSTEIN. I am someone who has seen something so cruel that i had to do something about it. A description about myself, well... I would say I am a lover of life, my own and my families. I will do all i can to help and respect those who cannot defend themselves, the galgos and their plight have taken me over and I will not stop writing about them until Spain has a law and can appreciate them for what they are, a mascot a pet, a true serene friend someone who will love you forever, and yet in dire need of rescue and freedom of only being known as a "hunting dog!" Me, this is me, at one with animals. A Riding instructor, my whole life an avid animal lover - this is me, at one with nature! Thanks for reading!